The pedigree of this Harry Palmer era spy movie might lead you to expect great things. Harold Pinter on scripting duties, Ipcress File (and Bond) composer John Barry furnishing the score, future George Smiley Alec Guinness in the not un-Smiley like controller role of Pol. Unfortunately, the enterprise is fundamentally flawed; this is a spook picture with no intrigue and one (mostly) shorn of suspense. The chief culprit is a script that replaces detective work with randomly bumping into the villains. But Michael Anderson must also take some of the blame. The man who called the shots on Around the World in 80 Days can work the widescreen vistas with the best of them, and West Berlin looks extremely pretty, but, when it comes to momentum and tenacity, he appears to be looking in the opposite direction. 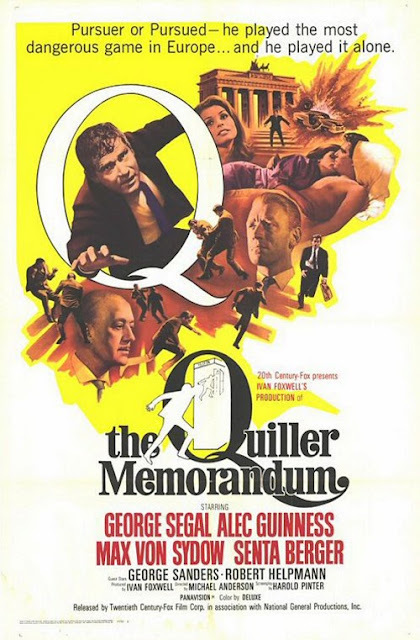 The Quiller Memorandum is based on The Berlin Memorandum, a novel by Trevor Dudley Smith. Smith was earlier responsible for The Flight of the Phoenix, penned as Elleston Trevor. His Quiller novels were written under the pseudonym Adam Hall. A short-lived Quiller TV series followed nearly a decade after this big screen incarnation, restoring the spy’s Britishness when it cast Michael Jayston as the lead (soon after he would appear opposite Guinness in Tinker Tailor Soldier Spy). Most likely the choice of George Segal derived from the old issue of transatlantic appeal, but you might have though the producers (Rank and Fox) would have been cannier in light of the new generation of thoroughly British agents finding international success (Connery, Caine, McGoohan on the small screen). To the extent that it comes from the mind of another, Pinter can’t take all the flak for the listless structure. This was one of his (fairly infrequent) pay cheque gigs and there’s only the occasional flash of the kind of dialogue he is known for; the interrogation scene in which Oktober (Max von Sydow) attempts to extract information from Quiller is notable, but generally Anderson downplays the playwright’s rhythms (it’s not unlike watching a David Mamet script that hasn’t been self-directed). For reasons best known to the casting directors (Pinter can’t have been arsed to come up with a decent explanation, and you cannot really blame him as anything would have been difficult to swallow), British Intelligence call American operative Quiller to Berlin to track down the location of a resurgent Nazi organisation. Several of their operatives have failed (and died), so they requisition a laidback Yank who sticks out like a sore thumb? Still, Quiller is purportedly top of his game and, credit to Segal, he appears to talk some mean German (at least, he has none of the hesitancy of carefully rehearsed non-native speakers). I’m in two minds about Segal’s performance. He never manages to convince as a seasoned professional of the spy trade; his manner is too breezy and nonchalant. Which works fine when dealing with the snooty Pol, and is particularly effective during his interrogation (a half-amused Oktober becomes progressively disenchanted with Quiller as he continues to resist the process). But we need to see the mask slip when he’s the only man in the room. With Anderson’s consistently light touch approach there is little weight to the proceedings, the odd set piece aside. And the entire premise is a bit iffy. Even if we allow for the rather fanciful idea of a group of Nazis (Nazis old and new; their group is called Phoenix, geddit?) attempting to regain power, which pushes the plot from topical Cold War activity into bombastic potboiler, Quiller’s objective is banal. Find their HQ. Quiller needs only employ a bit of schmoozing to locate his target, almost by accident. And throughout, both the plot and direction backpedal on life-threatening situations. The result is a polite lack of tension. Aside from the interrogation at around the mid-point, there’s a reasonable sequence where Quiller, released on a leash to consider Oktober’s ultimatum and dogged by Phoenix goons, grapples with a car bomb. But this is a picture where the climactic events occur off screen; you really need a satisfyingly ornate plot if you’re going to try and pull off that one. There are compensations, however. While is a disappointment stood next to the earthy Harry Palmer (whose second big screen outing occupied the same territory in the same year; Funeral in Berlin) or the intricacies of John Le Carre, but there are many incidental pleasures. Max von Sydow’s courteous Nazi comes early in his English language career, and it’s good fun to see Philip Madoc as a henchman (he would later essay one of the definitive comedy Nazis in Dad’s Army’s The Deadly Attachment). George Sanders makes a splendidly detached intelligence official, who bandies about casualty figures while asking a colleague, “How’s your lunch?” Alec Guinnes brings expected wit and gravitas. Then there’s Robert Helpmann, who in a few years would source the nightmares of a generation as Chitty Chitty Bang Bang’s Child Catcher. Senta Berger is also very strong as the schoolteacher Quiller falls for; indeed, her inscrutability is possibly the most successful aspect of the plot. The less said about Anderson’s decision to film her close-ups entirely in soft-focus, the better. There’s a sense that Pinter and Anderson have put all this effort into a soft target. The sumptuous location photography should have serviced a topical plot. The only whiff of politics is in Pol’s evident disdain for his American ally, and the (retrospective?) irony of Quiller’s statement of the distinction between his country and the Nazi regime (“I wouldn’t say dominate. We don’t want to dominate anyone”). The spy lore is at times amusing (“They’re milder than some of our other brands” runs a coded greeting based on the endemic activity of smoking) but the cumulative effect is off a No Man’s Land between the fantasy antics of Bond (without the compensatory action) and the grit and vigour of Palmer (without the byzantine chicanery).